Marine Nitrogen Oxides (NOx) emissions explained - Website of marpol-annex-vi! NOx is a term used to describe nitrogen oxides. NOx is a reactive gaseous compound that is one of the criteria air pollutants regulated by MARPOL ANNEX VI NOx Technical Code. The two primary oxides of nitrogen involved in air pollution are NO and NO2. Nitric oxide (NO) is colorless and essentially odorless. Nitrogen dioxide (NO2) is a reddish-brown gas with a pungent smell. NOx (NO & NO2) can irritate the lungs, cause bronchitis and pneumonia, and lower resistance to respiratory infections. NOx is also a precursor to the formation of ground level ozone (smog) and a contributor to acid rain. NOx emissions are produced during the combustion of fuels. The control of diesel engine NOx emissions is achieved through the survey and certification requirements leading to the issue of an Engine International Air Pollution Prevention (EIAPP) Certificate and the subsequent demonstration of in service compliance in accordance with the requirements of the mandatory, regulations 13.8 and 5.3.2 respectively, NOx Technical Code 2008 (resolution MEPC.177(58)). * subject to a technical review to be concluded 2013 this date could be delayed, regulation 13.10. The Tier III controls apply only to the specified ships while operating in Emission Control Areas (ECA) established to limit NOx emissions, outside such areas the Tier II controls apply. In accordance with regulation 13.5.2, certain small ships would not be required to install Tier III engines. The North American ECA came into force on 1 August 2011 and will take effect from the 1 August 2012. In July 2011, the 62nd session of the Marine Environment Protection Committee adopted the United States Caribbean Sea ECA, which is expected to enter into force on 1 January 2013, taking effect 12 months after (1 January 2014). For each NOx certified diesel engine there must be onboard an approved Technical File, NOx Technical Code 2008 2.3.4, which both defines the engine as approved and provides the applicable survey regime together with any relevant approved amendment documentation. As of October 2010 virtually all engines are surveyed using the Parameter Check method, NOx Technical Code 2008 2.4.3.1, whereby the actual duty, rating and NOx critical components, settings and operating values are checked against the given data in the Technical File. A key document in the Parameter Check procedure is the Record Book of Engine Parameters, NOx Technical Code 2008 6.2.2.8, which is maintained to record all replacements and changes to NOx critical components, settings and operating values. Engine surveys are undertaken on completion of manufacture and subsequently as part of the overall ship survey process; flowcharts illustrating the aspects checked at the various survey stages are given in NOx Technical Code 2008 appendix II. 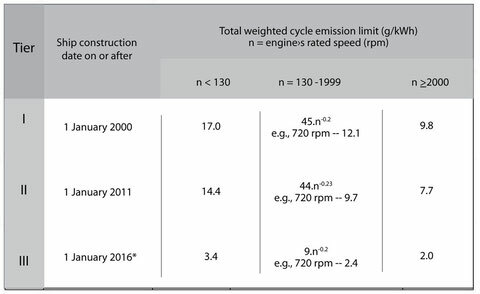 In addition, there is the case where a diesel engine is subject to “major conversion”, regulation 13.2. Of the three routes given, “substantial modification” and uprating, both as defined, involve changes to an existing installed engine and under these circumstances the relevant Tier is that applicable to the construction date of the ship onto which the engine is installed except, in the case of ships constructed before 1 January 2000, where Tier I is applied. In the third route, that of the installation of a replacement, non-identical, or additional engine then the Tier appropriate to the date of installation applies although, subject to acceptance by the Administration taking into account guidelines to be developed, in some circumstances it would permitted to install a Tier II replacement engine as opposed to one certified to Tier III, regulation 13.2.2. In the case of an identical replacement engine the Tier appropriate to the ship construction date applies. The revised Annex VI has also introduced the prospect of retrospective NOx certification, regulation 13.7, in the case of diesel engines of more than 5000 kW power output and a per cylinder displacement of 90 litres and above installed on ships constructed between 1 January 1990 and 31 December 1999. This will generally therefore affect only the main engines on such ships, the 90 litre/cylinder criteria represents, for example in current medium speed engine designs, engines with a bore of 460 mm and above. For these engines if a Party, not necessarily the ship’s flag State, has certified an “Approved Method” (*)which results in an emission value no higher than the relevant Tier I level and has advised of that certification to IMO then that Approved Method must be applied no later than the first renewal survey which occurs more than 12 months after deposition of the advice to IMO. However, if the ship owner can demonstrate that the Approved Method is not commercially available at that time then it is to be installed no later than the next annual survey after which it has become available. 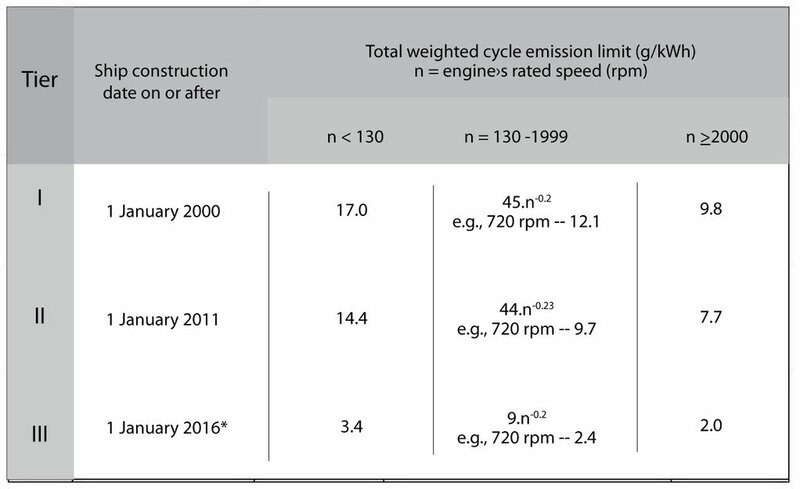 Given within regulation 13.7 are constraints on the Approved Method that limit its cost and detrimental effects on engine power and fuel consumption.